Like Oakland and San Francisco before it, Berkeley is encouraging healthful food options in corner stores. Jennifer Freese and her business partner incorporated fresh produce as part of Berkeley's Healthy Foods, Healthy Neighborhoods pilot program. Jennifer Freese and her husband lived across from Franklin Bros. Market in West Berkeley for more than a decade and a half before its longtime owner put the store up for sale. The bodega's facade on Bancroft Way had been boarded with plywood for some time and the building needed a lot of work. "I just thought, 'It's so convenient to have a little corner store in your neighborhood,'" she said. "'And wouldn't it be nice if someone fixed it up and made it into a nice little corner store?'" She envisioned a community convenience store where residents could grab a few items of fresh produce to round out a meal without having to get in a car. Freese said that after trying to convince every friend to take on the project themselves, one of her husband's childhood friends, Brian Wright, agreed to invest if she came on board with him. They purchased the store in 2014 and spent nine months operating it as it had always been, doing market research, and planning, Freese said, before they closed the bodega last summer for renovations, just as the City of Berkeley was soliciting store owners for a pilot program to introduce healthy produce in corner stores. The timing couldn't have been more serendipitous, Freese said. As part of the Healthy Foods, Healthy Neighborhoods pilot program, Berkeley’s Franklin Bros Market is offering fresh produce for residents. The city's Office of Economic Development and Public Health Division, along with LifeLong Medical Care and the UC Berkeley Blood Pressure Project, secured a $33,500 grant in the spring of 2014 from the UC Berkeley Chancellor's Community Partnership Fund to launch what they've dubbed the Healthy Foods, Healthy Neighborhoods program. The idea behind it, said economic development coordinator Jordan Klein, is to help people make healthier choices when eating, especially in areas where residents already suffer from poor health. African Americans in South and West Berkeley experience disproportionately poor health as compared to the rest of the city's population, according to the Public Health Division's 2013 Health Status Report. More than 60 percent of Berkeley adults have a healthy weight, but among African Americans, the statistics are the opposite: According to the report, more than 60 percent of African Americans are considered obese. Nearly 30 percent of students enrolled in the Berkeley Unified School District are overweight or obese, though that number is higher for Black and Latino children, and it increases as the students reach high school age. The US Department of Health and Human Services' National Heart, Lung, and Blood Institute has linked obesity to increased heart disease, high blood pressure, type 2 diabetes, strokes, arthritis, and reproductive problems, along with certain types of cancer. In their grant application for the Healthy Foods, Healthy Neighborhoods program, city staffers noted that place matters when creating solutions to obesity. "The underlying causes of and solutions to obesity lie in the environments and neighborhoods in which people live, work, and raise their families," the application reads. Providing better accessibility to healthy food within walking or biking distance ... coupled with community oriented nutritional education is an important part of this puzzle." Although Berkeley doesn't have any food deserts, which the US Department of Agriculture defines as urban neighborhoods and rural towns without ready access to fresh, healthy, and affordable food, it does have "food swamps," or neighborhoods with a concentration of negative food options, Klein said. "People can't make healthy choices if they don't have the option," he said. "It's about having more access and more regular access to healthy foods." Klein said that after soliciting corner stores owners to participate in the program, city staffers selected two stores out of the ten whose owners expressed interest in participating; both stores were within a block of public schools. 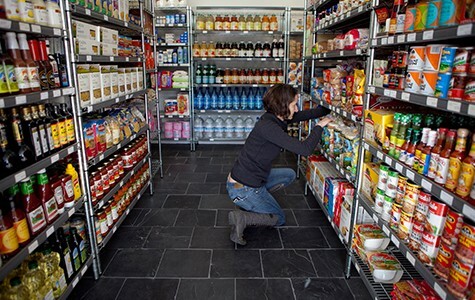 As part of the program, the city provides capital funds and technical assistance to help owners refurbish their store's interior, place products effectively, add signage, implement a marketing strategy, and connect to wholesale vendors. After receiving one of the grants, Freese and Wright reopened Franklin Bros. Market in November. Galal Al-Hadhrami rings up items for two young boys at Friendly Market in Berkeley, one of two corner stores chosen to participate in the city’s Healthy Foods, Healthy Neighborhoods program. It's a model that is already underway in San Francisco and Oakland, where nonprofits have taken the lead in starting similar programs. In San Francisco, nonprofits have been working in one form or another for the better part of a decade to introduce healthy produce in corner stores in the Tenderloin and Bayview neighborhoods, where access to healthy, affordable food is scarce. The program was formalized in 2013 when Supervisor Eric Mar introduced legislation to house the program in the Mayor's Office. In addition to assisting stores with business operations and physical improvements, the city also helps the store owners engage with the community to find out what kinds of products residents want, said Jorge Rivas, a project manager in the Mayor's Office of Economic and Workforce Development. "Some of the stores may have limited produce and some don't have any at all," Rivas said. 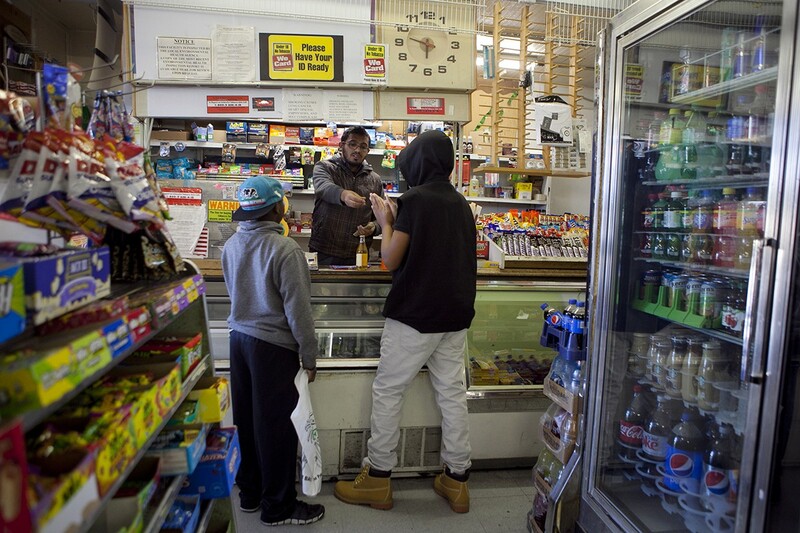 "Most have dedicated selling space to liquor and tobacco." Rivas said that instead of asking the stores to stop selling liquor and tobacco, which is a key source of revenue, program staffers work with the store owners to introduce new items and place those products in more prominent positions in the store. In Oakland, the nonprofit HOPE Collaborative has taken a slightly different approach by focusing on prepared foods in addition to produce. Project associate Angela Hadwin said fresh produce can be hard to sell because the profit margins are thin and shelf lives are short. "By adding a deli we can provide healthy prepared food options that use fresh produce and create better (profit) margins for the business at the same time," Hadwin said. The challenge with prepared food, she said, is retrofitting stores to include a deli counter, which is more expensive and presents more regulatory burdens than produce alone. For that reason, the nonprofit is now taking a more gradual approach, beginning with produce and working toward prepared foods, Hadwin said. The HOPE Collaborative has also launched a new prepared food distribution company called Last Mile Foods, which is piloting a program to place small refrigerators at corner stores that Last Mile stocks with ready-to-go healthy sandwiches, salads, and wraps. 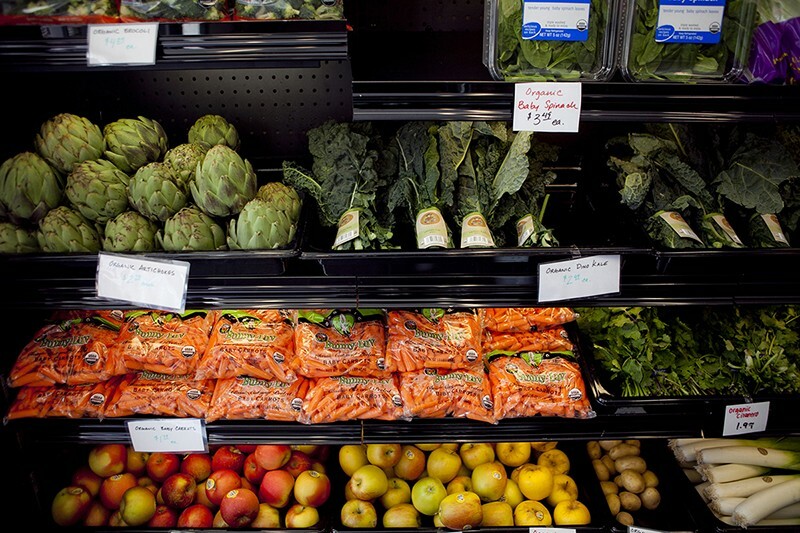 Because the programs are still very new — San Francisco's stores are furthest along; they rolled out the produce this summer — city staffers haven't fully evaluated the programs' success. Only one store in Oakland, One-Stop Market, has introduced fresh produce under the HOPE program. The East Oakland market hosted a soft reopening in late September. One-Stop Market owners Leonard and Chelsea Charles offered anecdotal evidence, though, that neighborhood residents are responding to the changes. 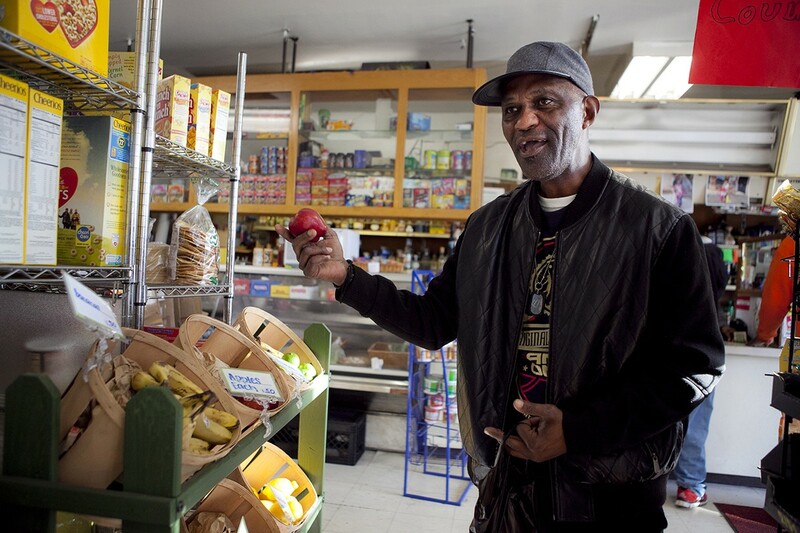 Larry Wilson examines some fruit before choosing what to buy at One-Stop Market in East Oakland, is working with the nonprofit HOPE Collaborative to bring healthy produce into corner stores. "The bananas are very consistent, the oranges and apples are pretty good, the bell peppers, potatoes, those are the most consistent items that are moving right now," Leonard Charles said. "It's hard because I did have some persimmons about three weeks ago and I couldn't keep them, and the brown pears, I couldn't keep those." For the Charleses, one of the biggest challenges in introducing the fresh produce is not the capital investment, but changing public perception of the foods. Fewer people have time to cook, Leonard Charles said, and residents who are accustomed to packaged or fast foods may not be as willing to buy fresh produce. "People want something to fill their bellies," Leonard Charles explained. "That's what we're up against." But Chelsea Charles said neighborhood residents are already taking note of the new items. "People are coming up to me and saying, 'I'm really glad you started selling fruits and vegetables,'" she said. "That's been the biggest thing."